After enemy is defeated, for 5 rounds, summoner's recovery become 0. Enemy weather a random rune every turn. When weathered rune is touched, rune spinning stops immediately and 3000 HP will be deducted. Enemy attacks once upon entry. After enemy attacks, 2 runes will be electrified. When electrified rune is touched, rune spinning stops immediately. If there is any electrified rune undissolved, summoner cannot attack. After enemy is defeated for the first time, enemy will fully recover HP with double HP, ATK and DEF. Summoner need to dissolve runes according to the frame shape (cannot dissolve together with runes outside of frame) to inflict damage to enemy. Every turn, enemy will mark all Heart runes. For every marked rune dissolved, summoner's ATK is reduced by 10%. Every turn, enemy will mark all Heart runes. For every marked rune dissolved, summoner's ATK is reduced by 20%. Summoner need to dissolve 10 or more combos to inflict damage to enemy (Only first batch of dissolve is counted). The lower the HP of the enemy, the dramatically greater its Attack will be. Summoner need to dissolve 8 or more combos to inflict damage to enemy (Only first batch of dissolve is counted). The lower the HP of the enemy, the greater its Attack will be. Enemy removes all effects in play upon entry. Enemy locks all God's active and attack. 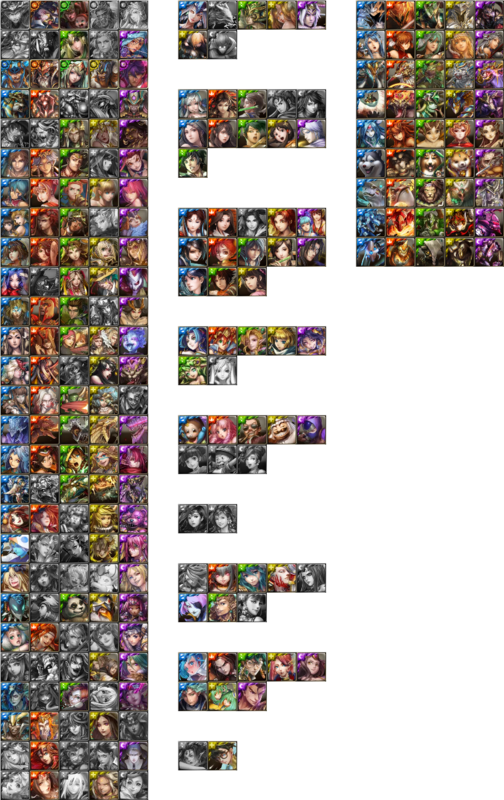 For every God in the team, enemy's ATK + 40%, to the max of +200% when there are 5 or more Gods in the team. The more attributes in the team, the lower the summoner's ATK. Hidden: Team consists of Members of 3 or more attributes. Skill I: For 1 turn, Dark ATK + 10%. Skill II: 30% of damage ignore Initial Shield. Skill III: For 1 turn, Demon ATK + 40%. Oh no I hate all these Phase thingy. Phew, make a huge mistake, boss round center part are all X+ initial combo shield. Miss out the first batch of dissolve part, haha. Actually, Barbhogg with Panda can easily farm this stage... will see whether farm or not..
Edit:NVM, you need a def breaker.... to kill the 80mil defense. However, if you kill right phase, then do 8 combo and kill center, the left die too, right? If I use a sniper to kill the left body part, will I move onto phase 2 immediately, or do I still get to use that turn to kill the right body part before moving into phase 3? According to 1 test done on Chinese side for previous SM, when center part is defeated, you will be considered clear even if left and right are still alive, so we can use this to our advantage, like PR starter + whatever burst to clear that 13M HP and 10+ combos shield 1 shot, no need to use any defense break, lol. (11-04-2016, 08:26 PM)johnnyTOS Wrote: If I use a sniper to kill the left body part, will I move onto phase 2 immediately, or do I still get to use that turn to kill the right body part before moving into phase 3? 1) Initially everyone are in phase 1. 2) When 2 parts remains, they enter phase 2. 3) When 1 part remains, that part enter phase 3. 4) When center part is defeated, the left and right part are defeated immediately. Both English and Chinese skill descriptions translate it this way. They may have forgotten to add the 2x attack to the 10+ combo shield of course. Yeah, i realize that too, this makes naming so troublesome, i just prepare for the worst case scenario though (assume everything is the classic trojan gold). Got anyone with the dimes want to test for it?